Decorative Style: Perfect table decoration for the Christmas season. 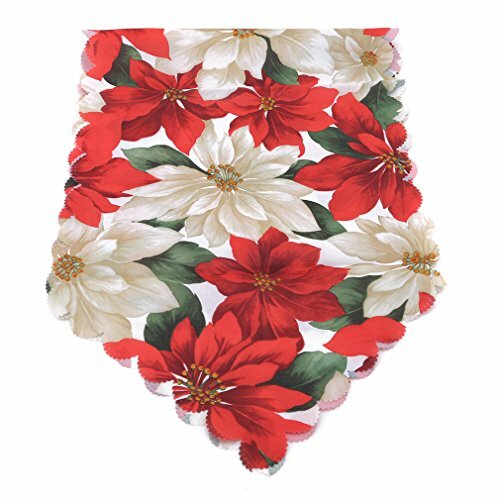 Colorful and delicate table runner with a Christmas design and a decorative border, to display for any holiday occasion or event. The beautiful table runner well decorates home, restaurant, wedding, parties and more, that makes your life chic and elegant. Perfect decorations for your dining table, dresser scarf, coffee table runner, or even bed runner. Quality and Durability: Machine Washable (Gentle Wash). Features a beautiful fabric ensuring top Quality and has a good quality and durable structure. The tablecloth that will last for many occasions. Ideal for wedding party, Christmas, create a festive mood and atmosphere. Add a Fresh Touch: Update your home with this festive table runner that will brighten up your home, and will surely add a beautiful touch to your Christmas table decor. Greatest Decoration: Dress up any table top for your Christmas holiday with this beautiful table runner. Spice up your home to add glamour and ambience. Live in style! Beautiful Holiday Style: Gorgeous tapestry table runner that beautifully embellishes your surroundings, with a beautiful Christmas design, to add flair to your Christmas table.